Brett RuteckySuper Funnel [review] and best bonus ever. 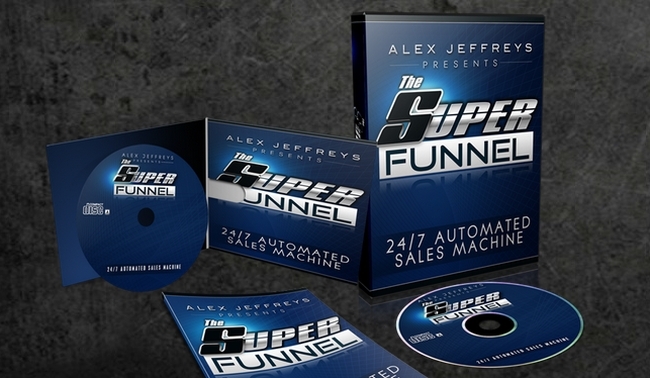 Today Im doing a review of the new Super Funnel training by Alex Jeffreys. Given that Alex is one of the top marketers in the IM business I often look at his launches. There are a lot of people in the IM space who brag about making 6 figures a year, but Alex makes multiple 7 figures a year. The simple fact is that he is on a level that is beyond what most other marketers are at. Alex’s new training, ‘The Super Funnel’ is a step by step guide that is related to one of my favorite topics, and ways to make money online. Product launching. However what is unique about this training is that it covers something that many other product launching trainings leave out. This training is all about how to get affiliates to promote your launch for you. Why is this important? Well the simple fact is its all about the affiliates. The simple truth is that you can have the best product in the world, but if you dont have affiliates backing you then you are not going to get many sales. In fact some of the worst products I have seen have sold thousands of copies and generated hundreds of thousands in sales simply because they had the backing of a lot of affiliates. Love it or hate it, its a simple fact, you need affiliates. Quite simply if you get them on board they can send you an unbelievable amount of traffic, which can lead to many times more sales than you could get on your own. One of the things that really shocked me when I first started looking into Alex is how open he is about how he runs his business. He has no problem explaining exactly what he does, and why he does it to anyone who wants to listen. In fact in late December I had a Skype video chat with his assistant and right hand man Simon because I was looking for some tips on maximizing the results of my own launch which was coming out in January. During that chat Simon explained to me the exact same things that Alex teaches in the Super Funnel training. I implemented Simon’s suggestions. What was the result? That launch (Video Auto Click) sold the most copies of any software I ever released. In short I know that the principles of this training work because I have used them myself with great results. Being able to peek into the business of a marketer who is as successful as Alex is well worth the low cost investment needed to get this training. Hi Brett! Just found your website and loving it! I can’t wait to pick up this amazing bonus to be able to add notification pro to my sales funnel! Thanks again! this is a steal – for a $7. You count me in …. going to buy – but one thing expose more your promo link – since is not sure where to access to buy it…. alex, just click the big green “approved” underneath the review. agreed though, that’s not terribly obvious for first-timers or infrequent visitors here. Same problem. When i click your Approve Link, you get take to get on the early bird list for The Super Funnel. Thats because I wrote this review around late last night and the launch did not start until 9am this morning. Sorry for the confusion. Where do we send our purchase ID? You can use the ‘contact me’ link at the top of this site. Well what can I say Mr Brett? you’ve done it again, I cannot resist this offer…!!! Can you provide your link to purchase. Can’t seem to find your link in your review. Simply click the graphics that says “Approved: Click here to learn more”. I just need to clarify we can use this in our own funnel and payout affiliate commissions on it also? how to access the bonus please? As per the instructions simply send me your receipt ID from JVZoo. You can use the contact me button in the header of this site to reach me. Thanks! Click the graphic that says “Approved: Click here to learn more” .. Thanks! Will buy the product because of YOUR bonus. Where is your affiliate link? Thanks. The bulldog had the link. Wow couldn’t believe It I had to read my email Twice, yes it’s a steal. Bought it straight away. I have various products by Alex Jefferies. Only last week I came accross Brett, and bought his Click Back Rewards great product..I am a new convert! Last weekend I viewed some other products by Brett on JVzoo he has some solid software..I have my eye on one on CPA marketing . I agree there with you Belal. Brett does have some great solid software, I have now few from Brett and I can’t fault any of them. Great to use and to also sell. The training and the support is second to none..
I’am allready a happy custumer of yours and hope to learn something from the product you recommend. The bonus is a steal. Can’t wait to test it. Thanks Brett. Great Deal for everyone. Met Alex at a Warrior Event in Orlando and really the real deal. Great social proof on his sales page too. Brett – What is the code to make sure at the bottom of the jvzoo – Want to make sure you get the credit. Just click the “Approved” graphic and I will get credit 🙂 Thank you! Just purchase through your link. Thanks for your review with the great bonus. Brett is the real deal and when he recommends a product – JUMP on it! Purchased earlier and the product is great – as well as the Bonus offer…. I already have most of his own products and make money off the generous Agency Access products he sells. His review is right on as I have gone through most of this ridiculously low price offer. Thanks again Brett the Man! Just a quick followup to my earlier comment…The Super Funnel is a superb product that really does teach about Product Launches and why it is important. Make sure you read all of Brett’s review and check product out…worth way more than current price. Also, the Bonus that Brett is giving is no small fry…you are actually getting a product worth over $350 annually…no kidding! I have it, installed and it is working like a charm. LOL, I don’t even know what I purchase, I just saw Brett’s great offer and jumped on it. Thanks for the great bonus offer. Just picked up my copy of super funnel. Just bought my copy too via your link. Thanks Brett. Always love your stuff, Brett! I may be weird…. though I know Alex Jefferies is a super marketer…I really find his vids hard to listen to for long periods of time. Joking aside, thanks for all that you do! Picked it up will be sending in my receipt so I can get started. Thanks greater than great value for the bucks spent today. I also picked up his final oto. Does the bonus include Notification Pro for my use? Or just the Agency rights? I’m not a fan of Alex Jeffrey’s long winded training (based on my previous purchase) but your sotware bonus is just amazing and something I can use to boost my struggling marketing effort . I’m in and looking forward for the training and your bonus software so I can finally be a vendor for a product I think will be genuinely helping buyers. Hello, Brett! I’ve bought through your link and used the contact form to send transaction ID. Brett- awesome bonus. Quick question for my own clarification…..
are we going to be hosting the software script / platform ourselves, under our own domain & branding, or reselling access to your hosted version? Resell access to my hosted version. Please follow the instructions you where given and email me your receipt ID to claim your bonus. Id you sent a CBR question it has been answered. I answer all emails quite fast. I purchased yesterday through this page. Did anybody receive the instructions for the Bonus : Notifaction Pro Agency setup ? Did you send me your receipt ID as you where told to do? I responded to every email I got. Hi Brett, I did not email in my receipt. I followed earlier instructions that said to just send it to your contact me? I haven’t received anything? Should I resend to email? My contact form emails me. The contact form emails me, if you sent it I should get it, I try to get to everyone as fast as I can (and normally do within an hour or two) but please understand I need to eat and sleep (and live my life) just like everyone else. If it has been more than 24 hours and you have not gotten a response please send it again. Thanks Brett. Just bought. One quick question. If we put our button on your sales page will we get the buyer’s contact info? Yes, thats the main point of selling your own product. Sure was a game changer – I have come to the habit of looking for your reviews if I am even considering a product. You have great in depth real reviews – a super scarcity these days. Ps I purchased through your link and sent the receipt yesterday through your contact – am awaiting a reply / details of how to secure the agency licence. I have responded to every email I got, check your inbox. Hi Bret is the bonus still available? Follow the instructions in red under the approved link. Just send me your receipt ID and Ill get you fixed up. Hey Brett, could not resist your amazing bonus.. it will help me out tremendously I think, not to mention TheSuperFunnel training value… so I just grabbed it and just contacted you with the purchase details. Also, you review blog rocks so please keep going, you just got another loyal follower, thank you very much! Sorry to bother again, but how long do we have to wait for your reply via email? Just need to know if my email came through ok? Thank you. Got it now, I am in, thanks again very much! I purchased yesterday and used the contact form on your website to send you the receipt # but I haven’t gotten any response yet. Is there any other method I can contact you? I would really love to get the bonus:) Thanks! I bought the Super Funnel program and I am disappointed in 2 ways. 1. It tells how to motivate affiliates to market for you but does not teach how to get the affiliates in the first place. I also did not see the look over my shoulder and see how I do it either. 2. They provide 2 different email addresses for refund request and both times I was redirected to a submit a ticket center. #1 Totally contradicts itself (motivating affiliates to market for you is exactly the same as getting them) .. and the super funnel explains it very well. #2 Really has no bearing .. you dont like the product because you have to submit a ticket to get a refund. That makes no sense at all. It like you buy the notificationpro for very low price. I am really new, what do I get to do with the products I would purchase ? Also, will I get help once I have bought the products within a forum. And , last question – how many upsells will I have to endure after the initial purchase ? You get video training, there are 2 (but that does not matter at all). No you wont get help from a forum. You will get videos that you can watch which teach you. Sorry one more last question, please. Is this exactly the same Super Funnel Program as what Alex is offering on his $8.15 program. As I said I dont know, Im not sure what you referring to. Okay I apologize… once I get started… anyway one more question. How can Alex’s program be better that say an Anik Singal or Adam Short or maybe a better question is how is it different ? I am trying to wrap my head around this affiliate marketing business and would love for some explanation. I get people who ask me questions a lot, how is it different from XYZ .. the answer unfortunately is almost always the same .. I dont know because I have not used XYZ… if I have not reviewed it I have not used it. I’ve sent two requests for the Notification Pro bonus, yesterday and again today. Looking thru the comments it seems I’m not the only person that is still waiting for access. Can you check to see if my request has been processed? I did not see any emails from you, but I just sent access instructions to the email that you put with these comments. Sorry if I did not get your emails. Found a couple in my spam folder. My apologizes. Not sure how that happened. You should be sorted now. Got it. I’m all set. I didn’t know I could create landing and download pages inside Notification Pro. Very cool. What if I bought “The Super Funnel” for $ 8.62 and make sure your aff link: 41 241 I’ll get super-double bonus of you? Well you get the bonus for buying through me, not sure where the ‘double bonus’ came from? are the bonus still available brett? Thanks for this awesome offer!!! i have bought and waiting for the bonus…. Receipt sent. Can’t wait to try it out! Thanks for the ownership rights. It’s like Christmas today! Now dancing around like a little kid having to wait in anticipation…. Ah. One of the things I hate about sending thru contact forms is I had a nice list of questions that I’m going to have to rethink out., when it’s an email I’ve still got a copy to resend. Can I ask you to check your spam or system for aakoster at yahoo? please. I will in the mean time send you my receipt immediately thru your email. Yes I check my spam folder 2x a day just to make sure no customer emails slipped in there. I sent via your yahoo address earlier today. Just sent you JVZoo receipt to your contact form. Awaiting your response for accessing notification pro agency. I have another software from you named squeezematic agency. Can I use your salesletter to resell it ? By the way, thanks for your bonus, It’s valuable for me, since it has resell rights. SqueezeMatic is a software for building sales letters, you can use it to build your own. What can I say about Brett? The guy over delivers whenever he sends out an email. However, this is the big one. For under $10, you get Alex Jeffreys Super Funnel and Bretts incredible Notification Pro Bonus. Now that is what I call the deal of the Century. I am glad I’m on this Guru’s list and will remain so until I retire from IM. Brett, if you ever release another Super high in deman software product with an Agency Licence, please send out an email to your list. I would be more than happy to pay for it. Many thanks for adding value to our lives. Hi Brett I have a question about your bonus? Where are you putting the buttons?? Id like to put them on my own website but i dont get enough traffic to it lol. Would you suggest I make squeeze pages to products im promoting and use the buttons on there to capture the leads?? NP is an auto responder, so use it like any autoresponder, make a squeeze page, drive traffic to it (I like FB ads). Also for questions about a software that you own, please use the HELP section in the software, I dont monitor my blog comments well enough for it to be used for something as important as support / customer questions. I just pick up The Super Funnel through your link. I just send the paypal id in my email. I have just bought the Super Funnel . Please send us the Notification Pro, Thanks. Your Notification Pro and Mike’s offer was too good to resist. Sounds like you entered your email wrong when you first created your account. Please be aware that a comment on a different product review is not a good way to get support. Also posting your receipt ID is a bad idea, because anyone can get it and I wont be able to tell them from you. Use the contact link in the nav bar of this site to send me a email.